emma dante | aldo miguel grompone d.i. Born in Palermo in 1967, Emma Dante explores the themes of family and exclusion through poetry of tension and madness, which are not without humour. Before becoming a well-known playwright and director, she got her diploma in 1990 at the Silvio D’Amico National Academy of Dramatic Art in Rome. 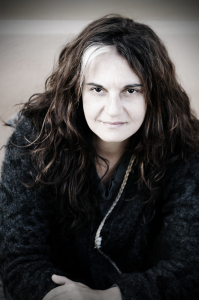 In 1999, in Palermo, she founded the company Sud Costa Occidentale, with which she won the Scenario 2001 prize for the show mPalermu and the Ubu prize for Italian Novelty. In 2001, she was awarded the Goffredo Fofi Lo Straniero prize as a young directing talent. In 2003, she won the Ubu prize for the best new Italian work with Carnezzeria and in 2004, the Gassman prize for Best director as well as the critics award (National Association of Theatre Critics) for dramatic art and direction. In 2005 she was awarded the Golden Graal prize for best director for the play Medea. She published Carnezzeria. Trilogia della famiglia siciliana with a preface written by Andrea Camilleri (published by Fazi), in 2007. Her first novel, Via Castellana Bandiera (published by Rizzoli, 2008), won the Vittorini and Super Vittorini prize in 2009. In October 2009, she won the Sinopoli culture prize. On 7 December 2009, she opened the season at the Scala with her setting of Bizet’s Carmen, directed by Daniel Barenboim. Between 2000 and 2010, the following shows were presented in Italy and abroad: mPalermu, Carnezzeria, Vita mia, Mishelle di Sant’Oliva, Medea, Il festino, Cani di bancata, Le pulle. Two tales for children and adults, published by Dalai are currently on tour: Anastasia Genoveffae Cenerentola and Gli alti e bassi di Biancaneve. In January 2011, an Italian and international tour began of La trilogia degli occhiali published by Rizzoli, which is in three chapters: Acquasanta, Il castello della Zisa and Ballarini. In April 2012, she produced La Muette de Portici by Auber, directed by Patrick Davin, at the Opéra Comique in Paris. Emma Dante wrote and directed Le Sorelle Macaluso, that was recently awarded as best italian performance of the season 2014/15 and best Director at the UBU Price. On 2014 she wrote and direct her first movie, Via Castellana Bandiera that was presented at 70th Biennale of Venise. For 2 consecutive years she open the Opera House of Palermo Teatro Massimo with Feuersnot by Richard Strauss conducted by Gabriele Ferro on 2014, and recently with Gisela! With music by Hans Werner Henze, conducted by Constantin Trinks..
From 2014 she is artist resident at teatro Biondo of Palermo and is director of the school of dramatic arts of the Permanent Theatre of Palermo.